Editor’s note: today’s caption is the answer to the May puzzler. If the jagged structures sticking out of the flat, dry landscape in northwest New Mexico seem otherworldly, that’s for a good reason. 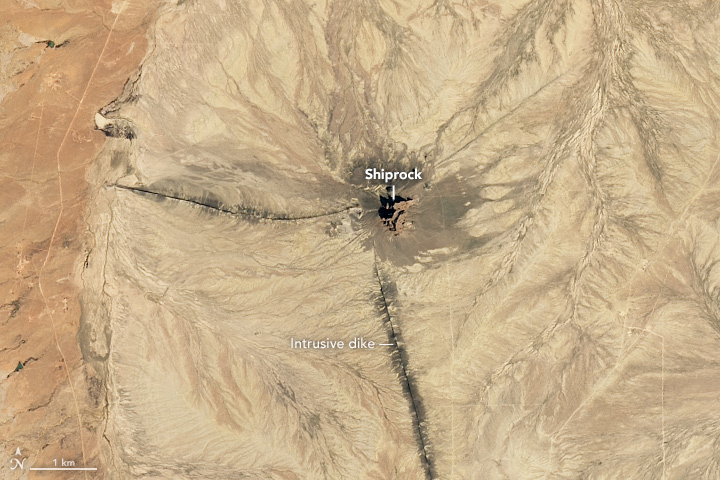 Protruding from the high desert plain, Shiprock has much in common with terrain on Mars, where volcanic activity formed similar razor-like, vertical walls. 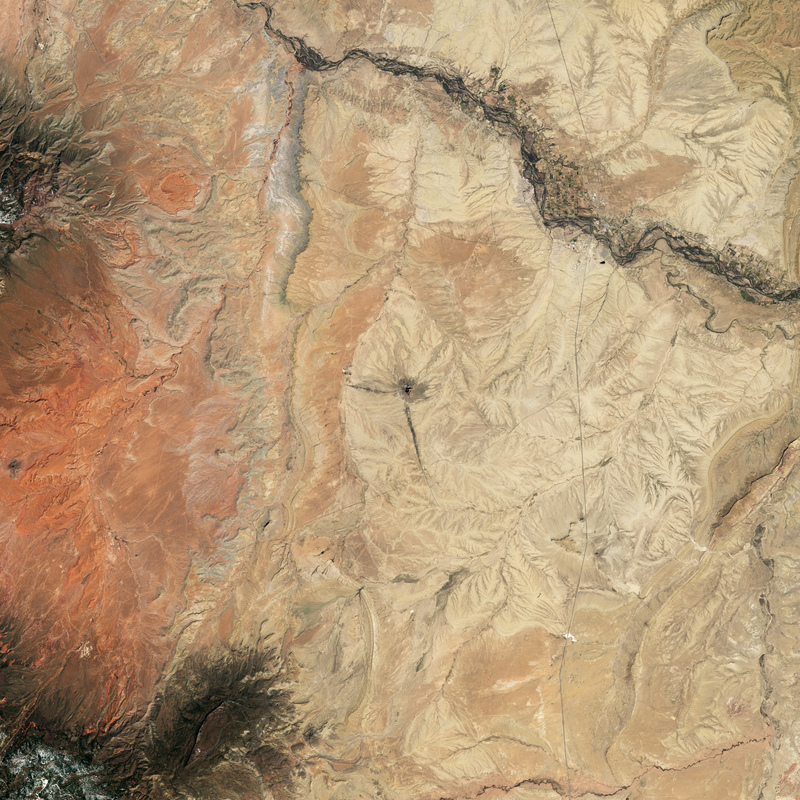 The natural-color image above, acquired by the Operational Land Imager (OLI) on Landsat 8, shows Shiprock on April 12, 2017. Its central formation, a stone tower, consists of a 30 million-year-old volcanic neck, “the central feeder pipe of larger volcanic landform which has since eroded away,” according to the New Mexico Bureau of Geology and Mineral Resources. Shiprock rises 500 meters (more than 1,600 feet) above the surrounding desert, but there was a time when it hid below the soil like a sunken ship under water. 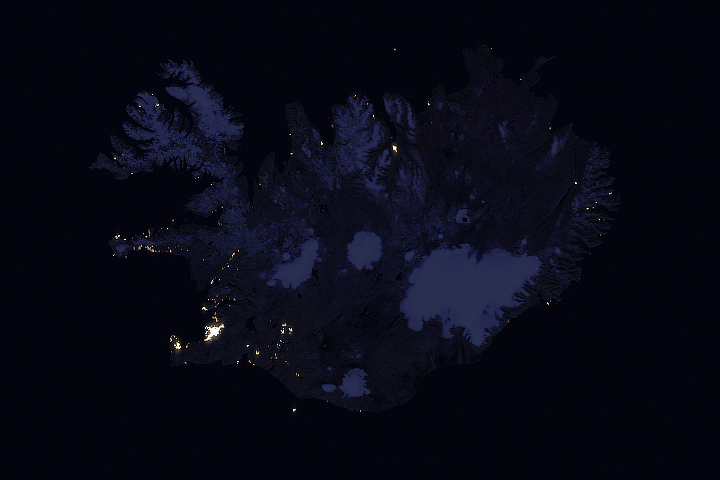 The Bureau estimates that it formed 750 to 1000 meters (2,460 to 3,280 feet) below the Earth’s surface. 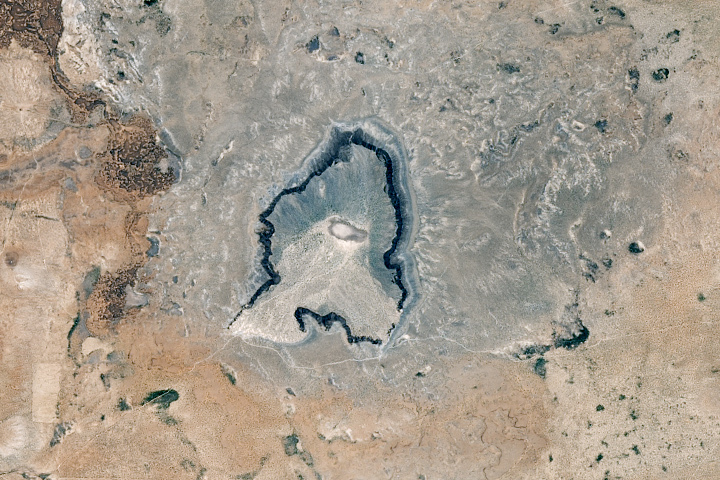 The formation was likely created in a hydrovolcanic eruption, in which “magma in upward-migrating dikes encounters groundwater, and heats it to steam under confining pressure,” according to a paper on the Navajo Volcanic Field. 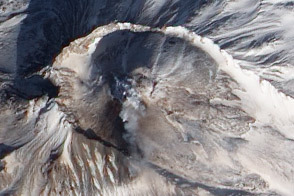 Two perpendicular walls—“radial dikes” that radiate outward from the volcano’s center—come together at the rocky outcrop. Initially, hot lava seeped into cracks in the older rock here, creating dikes. Since then, erosion has worn away the sandstone and shale around the dikes. The origin of Mars’s Medusae Fossae continues to puzzle geologists. 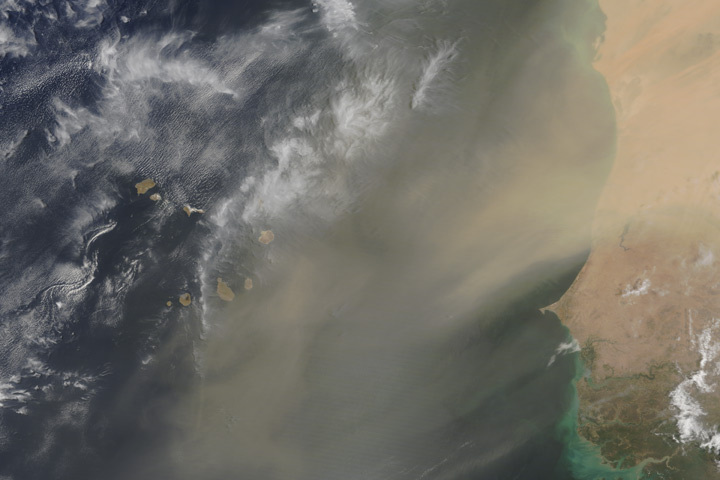 Located in the Amazonis Planitia region of the planet, it lies between two volcanic domes, Tharsis and Elysium. Scientists generally agree that the formation is young and fine-grained, but beyond that, they are divided in theories on how it was created. Some hypotheses propose that it was formed as result of deposits from a meteorite impact into an aquifer underneath the planet’s surface. Others suggest that it was created by pyroclastic flows—the outpouring of hot ash, lava, and other materials that run downhill after an eruption. The above image shows polygon-shaped ridges in the Gordii Dorsum portion of the Medusae Fossae region of Mars. 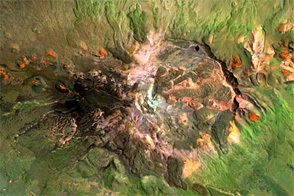 The image was captured on April 9, 2010, by the High Resolution Imaging Science Experiment (HiRISE) camera on NASA’s Mars Reconnaissance Orbiter. The dikes here are a fraction of a kilometer long—less than ten times shorter than their counterparts at Shiprock. NASA Earth Observatory images by Jesse Allen, using Landsat data from the U.S. Geological Survey and Mars Reconnaissance Orbiter High Resolution Imaging Science Experiment (HiRISE) image courtesy of the University of Arizona Lunar and Planetary Laboratory. Story by Pola Lem. Molten rock has formed jagged, razor-like walls in both places. Astrobiology Magazine (2007, November 4) The Mystery of Medusae Fossae. Accessed May 5, 2017. NASA Jet Propulsion Laboratory (2017) Mars Image Gallery. Accessed May 5, 2017. 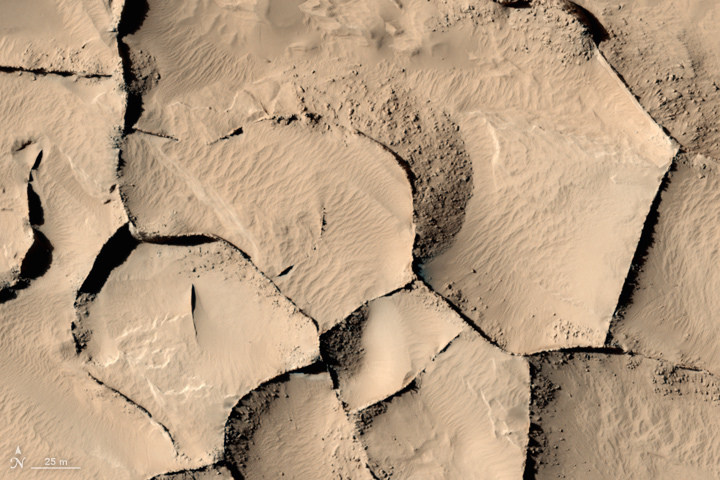 University of Arizona (2017) HiRISE High Resolution Imaging Science Experiment. Accessed May 5, 2017.